The Bureau hosts two main events that support the Aspire Program each year. The first is a free educational lunch aimed at helping potential applicants understand the application process and hear from a previous Aspire Award winner. This event will be held on Wednesday 6th February 2019 12:00pm-2:30pm at the Perth Convention and Exhibition Centre, River View Room 5. Please see the below invitation for more information. RSVP directly to Nicolle Davey, ndavey@pcb.com.au by Friday 25th January 2019. 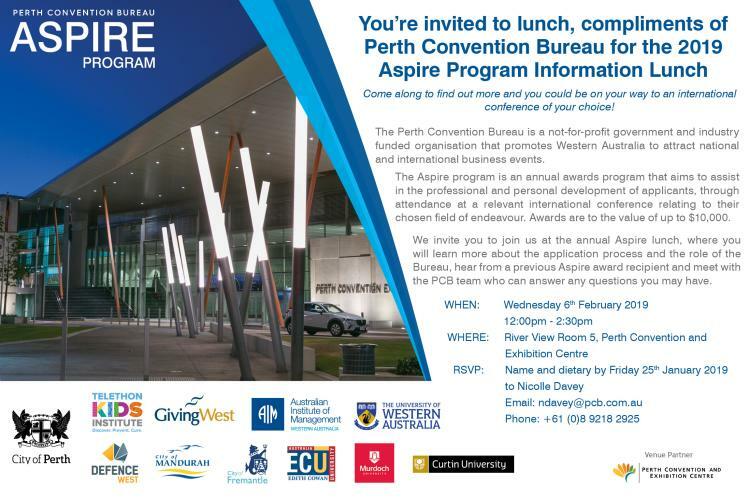 The 2019 program will conclude in June 2019 with the annual Aspire Program Breakfast Awards Ceremony hosted at the Perth Convention and Exhibition Centre. The 2019 program opened late October 2018. For more information on individual awards, please use the left hand side navigation panel.